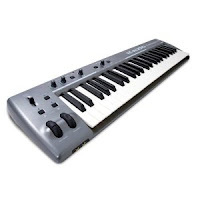 I had actually given up on my Keystudio 49 since M-Audio does not support those (since Mavericks) and since they did not work in Mavericks and Yosemite. For some reason while browsing the classifieds for a new sound module and/or keyboard-controller I plugged it in and fired up Mainstage 3 and... Voila - works like a charm. It seems that the USB class driver somehow shaked off some flaws. I can't say whether this is a general thing or just my Mac's combination of up and downgrades, emergency hotfixes etc. But I encourage anyone having stowed a Keystudio 49i away to give it one more go on Mac OS X El Capitan. UPDATE: as of El Capitan OS X 10.11.4 Keystudio 49i audio driver is very unstable. USB keyboard driver works, but audio stream is randomly cut, rendering the sound card section of the unit useless. UPDATE: under OSX Sierra the Keystudio49i is totally useless again. The Midi part does transmit to my DAW/Garageband, but the audio part interferes with what efter audio driver I'm using (Scarlett or Apple Core) and causes crashes. So Keystudio 49i is dismissed from my desk once again.